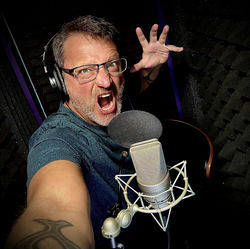 With literally hundreds of V/O credits to his name, Steve Blum is best known as the voice of "Spike Spiegel" from Cowboy Bebop, "Wolverine" from several incarnations of X-Men (animated movies, games, the Wolverine and the X-Men TV Series, The Super Hero Squad Show, X-Men Anime and more), "Orochimaru," "Zabuza," and others from Naruto, "Green Goblin" from the Spectacular Spiderman series, "Heatblast," "Vilgax" and "Ghostfreak" from Ben 10, "Grayson Hunt" (Bulletstorm) "Grunt" (Mass Effect 2 and 3),"Zoltan Kulle" from Diablo 3, "Abathur" from Starcraft 2:Heart of the Swarm, "Tank Dempsey" (Call of Duty), "Killer Croc" from Arkham Asylum, "Oghren" (DragonAge),"Vincent Valentine" (Final Fantasy VII), "Leeron" (Guren Lagann), "Jamie" from Megas XLR, "Storm Troopers" and many others in most of the Star Wars games, "Boogoo,""Sparky" and others from Disney's Anime - Stitch, The voice of 7-11, dozens of Digimon and a gigantic list of other characters from Anime, Video Games, TV and Film. In 2012, Steve was inducted into the Guinness Book of World records as Most Prolific Voice Actor in Video Games - appearing in almost 300 games (WAY more now!)! Currently, you can catch him on the super-charged CGI series Transformers: Prime, playing the sometimes delusional but always deadly Decepticon "Starscream" and as "Heatwave" on the action-packed, kid-friendly, Transformers: Rescue Bots! And most recently guest starring as "Devil Dinosaur"and "Sauron" on HULK: Agents of SMASH, several characters on Ultimate Spider-Man, Ben 10: Omniverse, the Regular Show, Tenkai Knights, and as the terrifying anti-bender "Amon" on the hit series Avatar: The Legend of Korra! And every Saturday night, catch Steve as "TOM" the robotic host of Cartoon Network's Toonami on Adult Swim. Look for him as the buckethead-bashing "Zeb Orrelios" in Star Wars: Rebels on Disney XD. And check out The Boxtrolls!! Steve 'dares to be square' as "Shoe" and "Sparky" in Laika's brilliant, award-winning feature film.